These look like plastic cuffs you’d fit around the barbell – though the material used is much tougher than the picture looks. While I am not sure what ‘military grade material’ exactly means, the message that these are tough is loud and clear. They are cylindrical, with one side open to wrap around the bar, this then locks into place – so you will not find them slipping off during a lift. The idea is that the normal close gripped hand does not mimic the natural more open handed setup that has been with us for thousands of years. When you open up your hand grip (which is exactly what Fat Gripz forces you to do), you give your arms a much better workout. Many commenters have advised that the effect is so noticeable that you should lower your target weight the first time using them. Key is the better muscle activation, which in turn leads to bigger strength gains. The makers also claim less imbalances and injuries – since the weight is spread over a larger area. You will also skip the need to do any separate grip exercises (though I assume this depends on exactly what you use your Fat Gripz for). 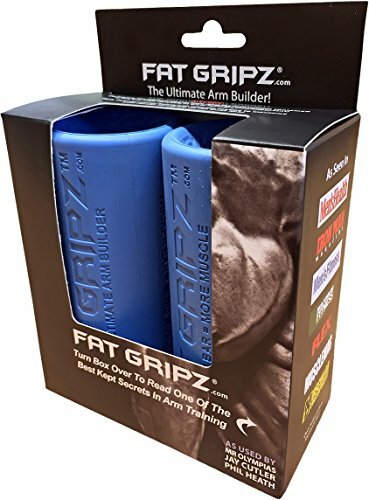 There is an impressive list of magazines which have featured Fat Gripz, you can find them all on the amazon page – so for now I’ll just note that this includes Men’s Heath and the New York Times. I was expecting more of a mixed feedback range, though you will quickly see that this is overwhelmingly positive. With something this simple, you will find a lot of experienced fitness fans pointing out that the effects were real. Some commenters described how they were surprised that their grip was weaker than they had imagined. Some people mentioned that they are too big for the Dumbbell sets, and that they worked better for pull-up type exercises than simple Dumbell lifts. Muscle activation and better results is consistent throughout the comments. I am sure there are cheap copies out there, though for the low price (and higher risk when it comes to dealing with weight), I would recommend you stick to the original brand. If you are looking to get better workout results the only real alternative is to change up your routine or lift more weight (under the supervision of your trainer).